Part 1 gives a broader overview of the legislations on waste management and handling. It also lists out the broad options available for large-scale waste disposal. Part 2 lists out simple steps that individuals can follow to segregate the waste they generate at source. 1. What is waste management? 2. What are the rules and regulations that guide waste management in India? 3. What are the common methods of waste disposal? 3.1 What is aerobic composting? 3.2 What is anaerobic composting? 3.4 What is a sanitary landfill? 4. How do I practice waste management at home? 5. What are the first few steps to initiate a waste management programme in your apartment complex? 6. What are the different types of waste? 7. What are ways of storing waste at homes? 8. How do I dispose my waste? 9. How do I manage my garden waste? Bio-Medical Waste (Management and Handling) Rules, 1998 regulate the management and handling of bio-medical waste and are applicable to all persons who generate, collect, receive, store, transport, treat, dispose, or handle bio medical waste in any form. E-Waste (Management and Handling) Rules, 2010 regulate the management and handling of electrical and electronic waste and is applicable to every producer, consumer involved in manufacture, sale, purchase and processing of these equipments or its components. Wet waste consists of kitchen waste - including vegetable and fruit peels and pieces, tea leaves, coffee grounds, eggshells, bones and entrails, fish scales, as well as cooked food (both veg and non-veg). Paper, plastics, metal, glass, rubber, thermocol, styrofoam, fabric, leather, rexine, wood – anything that can be kept for an extended period without decomposing is classified as dry waste. Household hazardous waste or HHW include three sub-categories – E-waste; toxic substances such as paints, cleaning agents, solvents, insecticides and their containers, other chemicals; and biomedical waste. E-waste or electronic waste consists of batteries, computer parts, wires, electrical equipment of any kind, electrical and electronic toys, remotes, watches, cell phones, bulbs, tube lights and CFLs. This includes used menstrual cloth, sanitary napkins, disposable diapers, bandages and any material that is contaminated with blood or other body fluids. 7. What are ways of storing the waste at homes? Store it in a bag in the utility area after cleaning and drying till it is picked up. No food residue must be left in the bottles and packets. Clean them as you would to reuse them. If clothes are totally unusable, or very damaged, they are categorized as dry waste. If clothes are soiled with body fluids, they become sanitary waste. If they are soiled with paint, or any chemicals, they are HHW (household hazardous waste). Store them in separate container which is kept closed, away from moisture and in which nothing else is put. Home composting can easily be done in any aerated container. Get more details on composting and begin composting today! If you live in a large apartment building, a community composting system like tank composting could be set up for all the wet waste from the residents. If not, the wet waste can be given out every day to your Municipality collection system. 8.3 Biomedical waste has to be wrapped separately in a newspaper and handed over to the municipality waste collection system. Expired medicines and injections, used syringes also have to be disposed in the same manner. 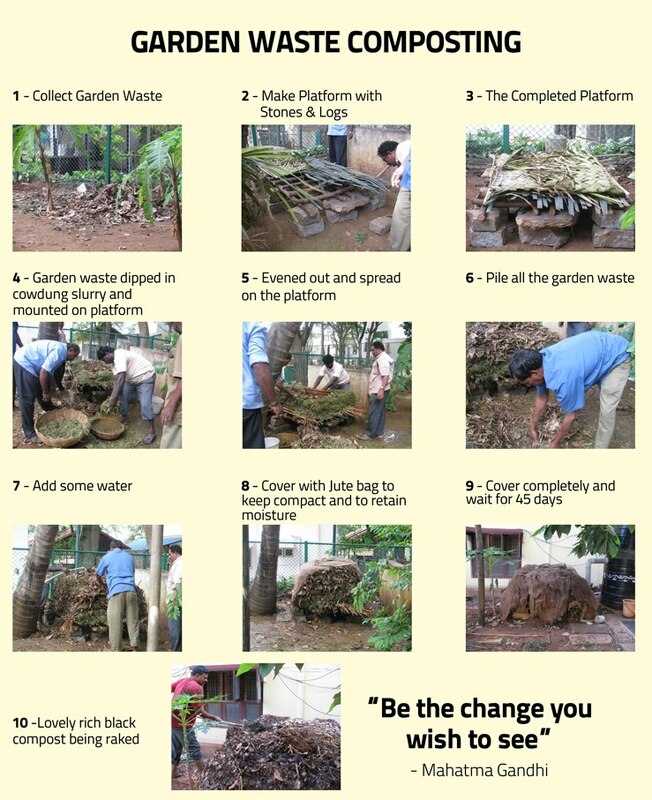 You can compost your garden waste. There are several decentralized, easy to use methods available for composting garden waste. Here is a step-by-step guide to treat garden waste. IWP requests users to view the same as a starting point in collating information on easy and effective ways of household waste management and to add more suggestions, information as responses in this thread.